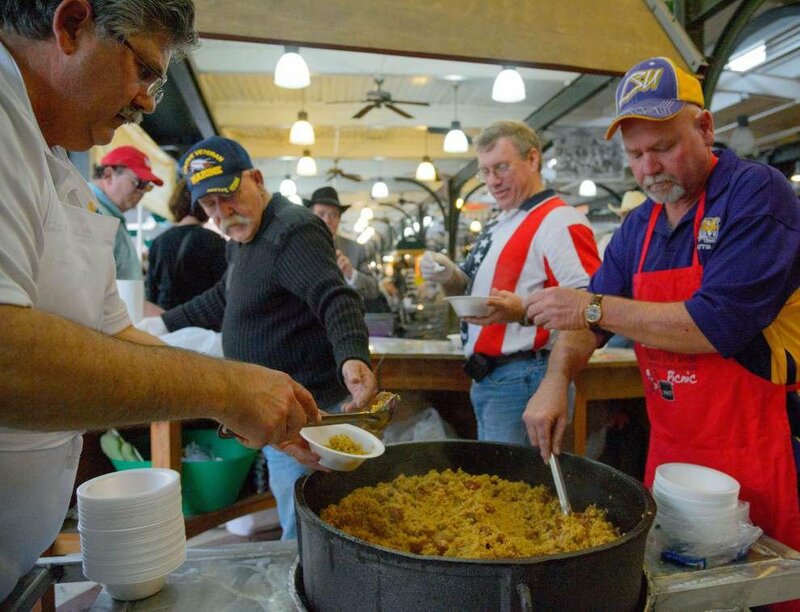 Advocate staff photo by MATTHEW HINTON--Randy Menard, left, Ron Guidry, Brad Nation, and Gary Williams, right, server Cajun Jambalaya in the French Market during a 250th anniversary of the arrival of the first boatload of Acadians in New Orleans led by Joseph Beausoleil Broussard held at the U.S. Mint in New Orleans, La. Saturday, Feb. 21, 2015. The first baptism of a child, Michel Daroy, took place on February 19, 1765. Advocate staff photo by MATTHEW HINTON--Brad Nation, left, and John "Spud" McConnell, known for playing The Kingfish Gov. 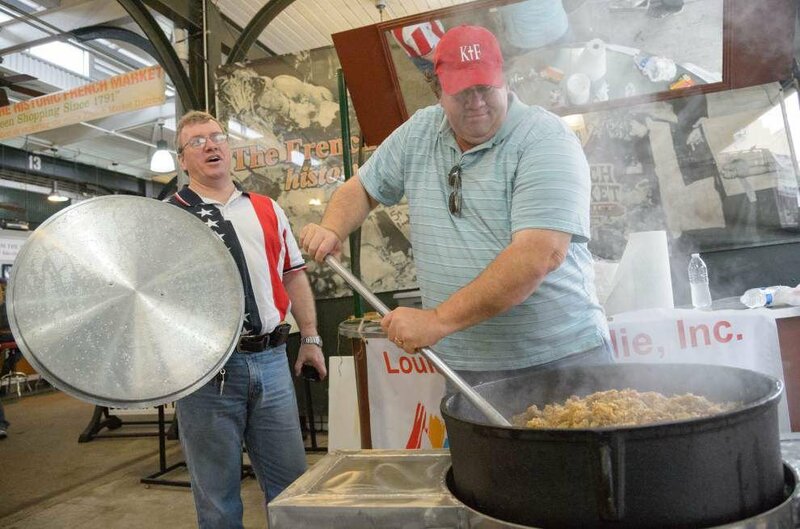 Huey P. Long, as he stirs some Cajun Jambalaya in the French Market during a 250th anniversary of the arrival of the first boatload of Acadians in New Orleans led by Joseph Beausoleil Broussard held at the U.S. Mint in New Orleans, La. Saturday, Feb. 21, 2015. The first baptism of a child, Michel Daroy, took place on February 19, 1765. Advocate staff photo by MATTHEW HINTON--Brad Nation, left, and John "Spud" McConnell, known for playing The Kingfish Gov. Huey P. Long, as he stirs some Cajun Jambalya in the French Market during a 250th anniversary of the arrival of the first boatload of Acadians in New Orleans led by Joseph Beausoleil Broussard held at the U.S. Mint in New Orleans, La. Saturday, Feb. 21, 2015. The first baptism of a child, Michel Daroy, took place on February 19, 1765. Advocate staff photo by MATTHEW HINTON--Bruce Daigrepont sings a song about towns and places in Louisiana with French names at a 250th anniversary of the arrival of the first boatload of Acadians in New Orleans led by Joseph Beausoleil Broussard held at the U.S. Mint in New Orleans, La. Saturday, Feb. 21, 2015. The first baptism of a child, Michel Daroy, took place on February 19, 1765. Advocate staff photo by MATTHEW HINTON--Warren Perrin a descendent of Acadians speaks next to Renaissance Cadienne, a Cajun Folkloric Troupe, at a 250th anniversary of the arrival of the first boatload of Acadians in New Orleans led by Joseph Beausoleil Broussard held at the U.S. Mint in New Orleans, La. Saturday, Feb. 21, 2015. The first baptism of a child, Michel Daroy, took place on February 19, 1765. Advocate staff photo by MATTHEW HINTON--Nicoline Perrin, 6, a descendent of Acadians waits for her turn to dance at a 250th anniversary of the arrival of the first boatload of Acadians in New Orleans led by Joseph Beausoleil Broussard held at the U.S. Mint in New Orleans, La. Saturday, Feb. 21, 2015. The first baptism of a child, Michel Daroy, took place on February 19, 1765. Advocate staff photo by MATTHEW HINTON--Ray Trahan a descendent of Acadian Michel Trahan stands as his the names of original Acadian names are read aloud at a 250th anniversary of the arrival of the first boatload of Acadians in New Orleans led by Joseph Beausoleil Broussard held at the U.S. Mint in New Orleans, La. Saturday, Feb. 21, 2015. The first baptism of a child, Michel Daroy, took place on February 19, 1765. Advocate staff photo by MATTHEW HINTON--Suzanne Leger dances as the Acadian spirit of The Muse at a 250th anniversary of the arrival of the first boatload of Acadians in New Orleans led by Joseph Beausoleil Broussard held at the U.S. Mint in New Orleans, La. Saturday, Feb. 21, 2015. The first baptism of a child, Michel Daroy, took place on February 19, 1765. Advocate staff photo by MATTHEW HINTON--Janie Dugas and Louis Drouant of the Renaissance Cadienne, a Cajun Folkloric Troupe, dance at a 250th anniversary of the arrival of the first boatload of Acadians in New Orleans led by Joseph Beausoleil Broussard held at the U.S. Mint in New Orleans, La. Saturday, Feb. 21, 2015. The first baptism of a child, Michel Daroy, took place on February 19, 1765. Advocate staff photo by MATTHEW HINTON--Willanna James dances with members of the Renaissance Cadienne, a Cajun Folkloric Troupe, at a 250th anniversary of the arrival of the first boatload of Acadians in New Orleans led by Joseph Beausoleil Broussard held at the U.S. Mint in New Orleans, La. Saturday, Feb. 21, 2015. The first baptism of a child, Michel Daroy, took place on February 19, 1765. An event commemorating the 250th anniversary of the arrival of the Acadians in Louisiana from Canada drew an overflow crowd to a room at the Old U.S. Mint in the French Quarter on Saturday. It’s a saga that began in 1765, when a boatload of 200 Acadians who had been kicked out of Canada arrived at New Orleans, led by Joseph Beausoleil Broussard. The exact date of their arrival is unknown, but their presence is confirmed by records of the baptism of the first child of that group on Feb. 19, 1765. The 250th anniversary ceremony was such a popular draw that even representatives of the French and Canadian consul-generals’ offices couldn’t get in at first because the room was filled to capacity with about 200 people. Others who wanted to attend waited outside the room on the Mint’s third floor, watching a video feed of the proceedings. “From Acadie to Louisiana in 1765 — the Birth of Cajun Culture 250 Years Ago” featured readings from documents and letters from the time of the arrival of the first Cajuns in Louisiana, Cajun music and dance, and talks by such scholars of Louisiana culture as Barry Ancelet, of the University of Louisiana at Lafayette, and Warren and Mary Perrin, of the Acadian Museum in Erath. She called the expulsion of the Acadians “a purposeful attempt to destroy the Acadian people by dispersing them across a sizable wedge of the earth,” even as far as the Falkland Islands off the coast of Argentina, 7,000 miles from their Nova Scotia homeland. But the scheme to stamp out the Acadians “failed utterly,” she said. Beausoleil, as he is known, was the leader of that first group of Acadians to reach Louisiana. He had taken part in a revolt against the British leaders in Canada and eventually negotiated a deal for the group to safely leave the area. The British were happy to see them go, Warren Perrin said. The arrival of the Acadians in New Orleans after a stop in what is now Haiti was “a transplantation of a culture that refused to bow down to the most powerful force on earth, the British government,” he said. Warren Perrin was instrumental in securing a statement from Queen Elizabeth in 2003 declaring that the deportation of the Acadians was done contrary to British law. “She established forever a day of remembrance of the suffering of these ancestors who fought and suffered so hard to make sure that this culture would not die,” he said. Ancelet, an author and a professor of Creole folklore, said willingness to improvise is what helped Acadians survive and thrive in their new homeland. Pointing to the Dauterive Compact, in which a group of Acadian settlers agreed to tend cattle for their owner, Ancelet said the Acadians probably didn’t know anything about cattle but agreed to do the job anyway. He said Cajuns continued to do the same thing in later years as they went to work in the oilfields and the seafood industry with little to no experience. The Acadians’ new surroundings in Louisiana were challenging, Ancelet said. They had moved to an area much warmer than the place they had lived in and had to put up with mosquitoes, heat, heavy rains and “prehistoric reptiles” — meaning alligators. “Don’t think for one minute it was easy for them,” Ancelet said. Co-sponsors of the event included the National Park Service; the Louisiana State Museum, which operates the Old Mint; CODOFIL; and the French American Chamber of Commerce. Students from a French immersion charter school, Lycée Français de la Nouvelle-Orléans, sang during the ceremony, and Cajun musician Bruce Daigrepont, who once led a musical group named after Beausoleil, also performed. Performance artist Suzanne Leger and dancers in period costume by Renaissance Cadienne also took part.